Tim Jemal, President; Marcia Milchiker, Vice President; and T.J. Prendergast III, Clerk. 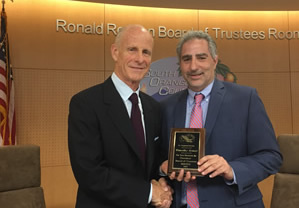 Acting Chancellor Thomas Fallo presented Trustee Tim Jemal with a plaque to thank him for his service this year as board president and presented him with a pin for his five years of service on the Board of Trustees. Curriculum revisions for the 2018-2019 academic year at Irvine Valley College. Notice of Completion for the Irvine Valley College Performing Arts Center waterproofing project for a final contract amount of $344,990. Guided Pathways Self-Assessment for Saddleback College and Irvine Valley College. Revisions to Saddleback College and Irvine Valley College instructional material and laboratory fees for 2018-2019. Award of bid to TEquipment.NET for electrical equipment at the Advanced Technology and Education Park IVC First Building Project in the amount of $116,129.30. Purchase of Fisher Scientific equipment pursuant to the Foundation for California Community Colleges Administrative Services Agreement No. CB-220-17 for expenditures not to exceed $80,000. Trustee requests for conference attendance. Acceptance of the District, Retiree OPEB Trust, Saddleback College Foundation, Irvine Valley College Foundation, ATEP Foundation, and SOCCCD Foundation Annual Audit Reports for Fiscal Year 2016-2017. Saddleback College Stadium and Site Improvement Project Change Order No. 1 with PCL Construction Services, Inc., resulting in an increase of $1,900,190 for a revised contract amount of $50,900,090. Advanced Technology and Education Park IVC First Building Project Change Order No. 4 with McCarthy Building Companies, Inc., resulting in an increase of $357,842 for a revised contract total of $17,911,187. Update of authorized signature list of Board of Trustees designees to approve documents and contracts. Allocation of $3,679,421 for one-time faculty stipend costs relating to the Canvas Learning Management System conversion. Budget transfer of $3,679,421 from the reserve for contingencies for one-time faculty stipends relating to the Canvas Learning Management System conversion. Ratify the appointment of Dr. Thomas M. Fallo to the position of Acting/Interim Chancellor. Trustee Whitt attended many retirement celebrations, which she said were joyous and sad because she feels she grew up with so many who are retiring. She attended the nursing pinning ceremony at SC and appreciated that SC President Anderson was a part of the event. She attended the end-of-year celebration at IVC and commended the camaraderie at the campus. Trustee Wright attended a number of retirement celebrations and thanked the retirees for their service. He attended the Feast of Lights event at SC. He remarked on the serious impact the recent wildfires have had on Southern California colleges and students. Trustee Prendergast wished the retirees well and said they will be sorely missed. He attended the OC Pathways Showcase and commended President Anderson for his presentation with OC Department of Education Superintendent Al Mijares. He attended the Feast of Lights and the nursing pinning ceremony. Trustee Milchiker wished the 116 retirees well and enjoyed attending their retirement celebrations. She attended the OC Pathways Showcase where SC and IVC were well represented. She attended the Feast of Lights, nursing pinning ceremony, a business leaders society event at IVC, the end-of-year holiday party at IVC, and a biological sciences conference at SC. She enjoyed being interviewed on Laguna Woods television. She congratulated Grace Garcia for being named the District Services Manager of the Year. Trustee Jemal thanked the retirees for their service and wished them the best of luck. He attended the SC President's Circle foundation luncheon and noted the event's high turnout. He voiced concerns about the current House and Senate versions of the federal tax bill which would impose a tax increase on a significant number of constituents in our district, and remarked on the impact the bill will have on students. Trustee Jay attended many retirement celebrations and wished the retirees well. She attended the Feast of Lights and enjoyed John Huntington's vocal performance. She attended the SC President's Circle luncheon and appreciated hearing from students who spoke about what scholarships have done for them. She is participating in the IVC Adopt-a-Family program and has "adopted" two single female students with children. Trustee Lang said it is bittersweet to lose so many great people who are retiring. He attended the SC President's Circle luncheon, where he enjoyed hearing from the college president, students, and Winnie Johnson, the acting executive director of the foundation. He congratulated IVC's Daniel Luzko on the release of his new CD, Gary Rybold on his presentations at the International Conference on English Language Teaching in China, and the IVC women's volleyball team for winning the state championship. Student Trustee Larson expressed his appreciation for the retirees. He started a business club on campus and raised $500 for student scholarships by selling small succulent plants. Acting Chancellor Thomas Fallo's written report included: Following a unanimous vote by the board of trustees, Dr. Fallo was appointed to serve as acting chancellor of the South Orange County Community College District. Dr. Fallo has a 45-year career in the California Community Colleges and retired as superintendent/president of El Camino College in 2016 after serving 21 years in that role. He previously worked at the Los Angeles Community College District, serving as acting and interim chancellor and vice chancellor of business services. Prior to that, he held the positions of vice chancellor of business services and vice president of administrative services at both El Camino College and Glendale Community College District. Welcome to Toni Brady, the district's new risk manager. Toni comes to the district from Keenan & Associates and has over 17 years of risk management experience. A committee of employees representing Human Resources and Payroll has been established to optimize processes for the various types of leave available to employees. Acting Chancellor Fallo remarked that it's an honor and pleasure to serve as acting/interim chancellor and commended Grace Garcia as the District Manager of the Year. He recognized Trustee Jemal for his five years of service on the Board of Trustees. Saddleback College - President Anderson's written report included: The college completed its Guided Pathways self-assessment survey. President Anderson spoke at the OC Pathways Showcase on November 29, where he highlighted the importance of the college's pre-K through 12 partnerships. He also attended the annual convention of the Community College League of California from November 16-18. Faculty, staff, students, and administrators are meeting bi-monthly to design a College Promise program. The Classified Senate's Thanksgiving fundraiser for veterans brought in one ton of non-perishable food and nearly $2,000 in monetary and grocery certificates for 60 families. Extended Opportunity Programs and Services (EOPS), Cooperative Agencies Resources for Education (CARE), CalWorks, and the Associated Student Government provided a Thanksgiving dinner to students. ASG collaborated with Adopt-A-Family to provide gifts to the children of CARE students and Toys for Tots donated to the the children of EOPS/CARE students. The college hosted a Title IX training for district employees on November 13. The presenters were Deputy Attorney General Janet Neely from the California Department of Justice and Sergeant Andrew Tucker of the Criminal Investigations Burea and the University of California Police Department. More than 350 families from over 25 public and private high schools attended Family Night on November 14. The VETS program was awarded a $55,000 grant from the Orange County Community Foundation's Real Estate Veterans Initiative. College representatives met with California Department of Finance officials regarding the Pathway to Completion-Veterans Credit Articulation Track project. President Anderson thanked the board members for their kind words on the retirees. He mentioned that the college is in the process of hiring two new vice presidents and thanked the search committees for their efforts. The college is gearing up for its 50th anniversary and will invite the trustees to various events. Irvine Valley College - President Roquemore’s written report included: Student ambassadors raised nearly $900 at the first #StudentsHelpingStudents quad sale on November 8. A celebration honoring the release of a CD co-composed by Professor Daniel Luzko was held at IVC's Performing Arts Center on November 13. Communication Studies Academic Chair Gary Rybold presented at the International Conference on English Language Teaching in Xi'an, China, in October. His presentation focused on a paper titled "Bringing Communication Soft Skills into Career Technical Education Training for High School Students" that he co-authored with CTE Director Merry Kim and communications studies intructors April Griffin, Liza Rios, and Kelly Kehoe. He also led a workshop titled "Activity-Centered Pedagogy: Learning How to Use Critical Thinking-Based Instructional Strategies for English-Language Learners in Oral Communication Classrooms." The Irvine Valley College women's volleyball team captured the state title after an undefeated 2017 season. The men's soccer team won second overall in the Orange Empire Conference, enabling the team to go to the Southern California regional playoffs in the postseason. President Roquemore attended the annual convention of the Community College League of California on November 16-18. On November 29 he led the administrator and manager fall retreat at the Duck Club. The day included networking, leadership and team building, and a presentation by Vice Chancellor of Human Resources Cindy Vyskocil. President Roquemore congratulated the new and returning board leadership and thanked the board members for everything they do for the district. He welcomed Acting Chancellor Fallo, who he has known for a long time and looks forward to working with in the months ahead. Irvine Valley College Associated Student Government's written report included: The ASG of IVC Community Outreach Committee and Interclub and Co-Curricular Council hosted a Giving Back and Volunteer Fair on November 16. A record number of students submitted their names for this year's Homecoming election. The five men and women who received the most votes were elected to serve on the Homecoming Court and will participate in leadership development training and ASG spring semester events. ASG worked with the Office of Student Life and Equity Programs, Office of International Students, and the International Club to celebrate International Education Week. ASG hosted its annual end-of-the-semester stress buster event on November 29. The Budget and Finance Committee conducted annual site visits with each ASIVC-funded program, department, and club. The board meeting may be viewed online at www.socccd.edu. Television broadcasts are scheduled for 7 pm on Friday, December 15 and Saturday, December 16 on SC Channel 39 and IVC Channel 33. SC TV 39 has an additional broadcast on Sunday, December 17 at 7 pm.